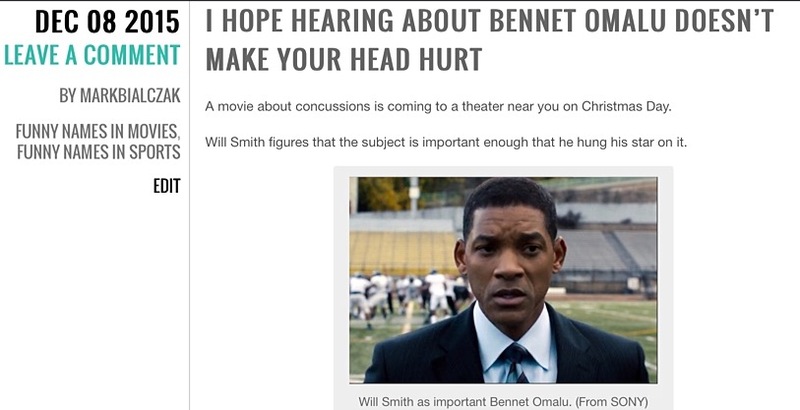 A movie about concussions is coming to a theater near you on Christmas Day. Will Smith figures that the subject is important enough that he hung his star on it. I’ve seen the trailers for Concussion on the big screen. I’m a football fan, have been my whole life. Yet I’ve become increasingly concerned about what’s happening out there to these fellows because of the shots they take to their head. Football, the world is finally coming to grips with, is dangerous to the brain. You can read the rest of the story over at the Blog of Funny Names by clicking here. I saw a preview for this the other day and it looks like a great movie. I have to say though, the way Will Smith did that accent drove me insane. Even in those few minutes. Hopefully it will grow on me in the movie. I hope Will’s way with Dr. Omalu becomes more pleasing to your ear, Jenny. Or else the popcorn stand will get a lot of visits, and this movie is too important and that imitation butter flavor will become more cloying than the accent. Happy holidays, my friend.